THEY were supposed to be relative cushy jobs for the AFL's three most senior coaching citizens. Mick Malthouse, 61, Rodney Eade, 57, and Paul Roos, 51, have all been there and done that in footy. 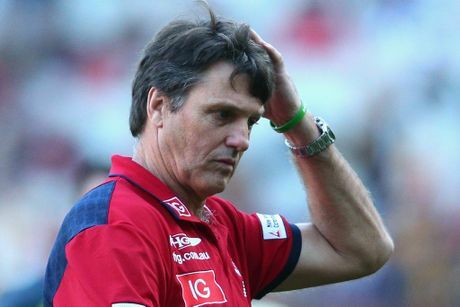 All have broken new ground during their respective careers, particularly with non-Victorian clubs - Malthouse at West Coast, and Eade and Roos at Sydney - leaving very little, if anything, left to prove. But the game has not been kind to the trio in season 2015, Roos' Melbourne sitting 15th, Eade's Gold Coast 17th and Malthouse's Carlton 18th after their clubs lost by a combined 275 points on the weekend. Malthouse has coached 406 wins during his 31 seasons in charge, but it's hard to see him adding to that tally. Despite Blues president Mark LoGiudice (again) saying otherwise, it remains to be seen whether he'll even add to his record-breaking 716-game total. The Blues lost to bottom-placed Brisbane last week, but the defeat to GWS on Saturday night was even more damaging to both coach and club. In what was a glorified training drill for the Giants - and as Bomber-turned commentator Scott Lucas said, treating their opponents like witches hats - they registered the equal-second-most forward-50m entries ever recorded, and ensured the fifth-biggest discrepancy in inside-50s between opponents (80-32). More concerning for Carlton, though, was the fact just 16,676 people watched on at Etihad Stadium - the club's lowest home crowd since 2000. And sadly for the rest of us, we've got to endure the Blues in the prime Friday night slot over the next two weeks against Geelong and Sydney. Ironically, Eade filled the position at Collingwood that had been created for Malthouse, that of coaching director, before relocating north for sun, surf and success. Eade saw taking over the seemingly rising force from the Gold Coast as a "mouth-watering" proposition. But, instead of being given the keys to a swish new apartment, it's turned out he's got a genuine fixer-upper. The Suns recorded the fifth-lowest amount of inside-50ms in a game on Saturday. Yes, they have major injuries, but so did their opponents, the Eagles. After taking the Swans to a grand final and the Bulldogs to three prelims, Eade's got three years to try and rectify the fact he now holds the record for most games coached without a flag (321). Remarkably, Roos experienced the first defeat by 100 points or more in 231 games as coach when Hawthorn made a mockery of Melbourne's supposed improvement. Of the Hawks' now 12 wins in a row over the Demons - dating back to 2006 - that 105-point flogging was the biggest. Are they as far away as ever? Unlike Malthouse, Roos already put a limit on his time at his new club - three years - before he hands over the poisoned chalice, I mean the reins, to Simon Goodwin.